Library Catalogs and Vendors Online: Begin your search for published records at your own home by checking online library catalogs and vendor booklists. Research Techniques: Please follow this important advice: (1)Document your sources! This is so important that I should say it at least 3 times! Record the source of each item of information, both in your database and on each sheet of notes. This procedure allows both you and others to return to original sources. Moreover, you can evaluate the quality of the source material if conflicting information arises from other sources. (2)Keep a log of resources consulted. Note briefly what was found. If you didn’t locate the information you were seeking, note that also. You will save yourself hours of unnecessary rechecking. A review of your log will help you decide what sources you have missed. I strongly suggest that you keep a separate log sheet for each surname. And don’t forget to record the location of the sources you check. When your research progresses, you may find you want to return for a further look at the resource. Documentation Help: Let me recommend an excellent handbook which will teach you how to properly document your source material. Elizabeth Shown Mills is the author of Evidence! Citation and Analysis for the Family Historian. This book is widely available from genealogical vendors, online booksellers, or you can order it from the publisher: Genealogical Publishing Co., Inc. 1001 N. Calvert St., Baltimore, MD 21202. 2. And I’m proud to refer you to the Circulating Collection of genealogy books available from the Midwest Genealogy Center, part of the Mid-Continent Genealogy Library in my own area. 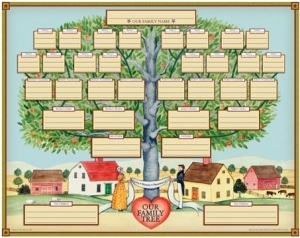 http://www.mymcpl.org/genealogy. This library has acquired 3 collections from organizations with which I’ve been involved over the years. These books show up in the online catalog. There are of course many books listed as well that are Reference Only. Your local bookstore usually has a very limited number of genealogy titles. There are, however, many vendors who deal strictly with genealogical and historical materials. And the online bookstores now carry a long list of appropriate titles. Link to my bibliography page for descriptive listings of books you should consider as you select books to use at home. Also at that site, I provide links to genealogical vendors who have online sites. Genealogists find themselves returning time and again to microfilm readers to read census. A careful study of census records often helps to unravel a complicated family story. We’re often surprised and pleased to find neighbors who migrated with our ancestor or even frequently to be related by blood or by marriage. We acquire insight into financial condition, education status, employment, citizenship, ages, male/female, race, extended family, family size, birth order, places of birth, name changes, language, and even more. Now we have the option to turn away from the microfilm reader and view census over the Internet. You can view census at any of the National Archives branches and at LDS Family History Centers. Genealogy.com and Ancestry.com offer this service on a subscription basis to individuals. Census data and views are also offered at HeritageQuestOnline. Check with your public library also; some libraries provide access to either/or Ancestry and Heritage Quest databases, including census. Some counties in U.S. GenWeb are placing census transcriptions on the Web. The 1930 Federal Census was released on April 1, 2002. Don’t expect the 1940 census to be made public until 2012. Know that different information was collected at each census. You need to closely examine the forms and see what potentially may be included for your ancestors, assuming that the census collector conscientiously collected all the data as instructed. You might want to download my sheet of Federal Census Descriptions which I developed to use with my classes in recent years. It’s in PDF format. It summarizes the information requested for each of the federal census years. And when you desire even greater detail, visit Genealogy.com for the article Every Ten Years: Key to the United States Census, 1790-1930. There you can choose a census year and get a full description of what questions were asked in that particular year along with significant facts about that particular census. You can also download a printable abstract of the census forms of your choice. Look at the Census Forms themselves to see how the information was laid out. Have a blank form in front of you while you are working with either the microfilm or an online image–the information on your ancestor may be well down on the page, far from the column headings and therefore hard to track. U. S. Census Bureau: This is a great site for outline maps for each state, showing all current counties. Go to “State and County Quick Facts”and select a state. In addition to reading interesting facts about the state, click on the words near the top that say [State] counties – view map to take you to an outline map you can print; or with a right click, you can save a map to your hard drive. Also — you can click on any county of choice and get facts specific to that county. Note also that you can type in a city or town or zip code and learn which county it is in. County Formation Maps are also offered by Family History101, using maps made by AniMap Plus County Boundary Historical Atlas v. 2.5 (Win): You have two choices: (1)Link to rotating animated state maps showing all the county boundry changes for each year overlayed with past and present maps so you can see the changes in county boundries and State Department of Transportation Maps.Link to a state. Use the buttons provided — Play, Stop, View, Prev, and Next. – OR — (2)Pick a year to see the existing counties for that year. At the bottom of each state’s site is a list of that state’s counties. Antique Atlas Mapsare being added by Family History 101 for some states for viewing as previews in PDF format or for purchase. Other Maps to Purchase: There are so many offered by commercial sites that I’m going to send you out on your own to pick and choose. Desktop Reference Books: For a long time, I’ve used Map Guide to the U.S. Federal Censuses 1790-1920 by William Thorndale and William Dollarhide. For precise formation dates and the name of the county or counties of origin, I also refer to Everton’s The Handy Book for Genealogists; and Ancestry’s Red Book: American State, County & Town Sources. I have an assortment of atlases, and I sometimes turn to a Gazetteer. Software: Animap by Gold Bug Softwaredoes more than just show counties at the time of census. Get Organized: Organize your genealogical materials so that you can easily share them with others! I suggest you file your research materials in file folders labeled with surname, followed by the geographical location. Also, since you will likely acquire much material through correspondence, you might choose to separate correspondence into another folder or folders to file with the associated surname. Having experimented with a variety of filing methods, I’ve found what works best for me is to put the “treasures” into archival-safe sheet protectors and then insert them into binders. I began with a binder for each great-grandparent and that person’s ancestral line, adding more binders when necessary for related families. Along with documents, I insert family group sheets, photographs, timelines, migration paths, and census summaries into the binders. Then I add biographical sketches and surname summaries, including the legends passed down through the family. This combination of file folders and binders provides an efficient method for filing backup materials along with coffee-table style presentation binders which appeal to family members far more than a jumble of notes in file folders. A word of advice–include documentation in the binder contents because these are likely to become the reference materials for future researchers. I use a computer to document our family history and to create a newsletter and resources for genealogists. When I enrolled in my first computer course back in 1982, I pondered the possibility of using computer technology to organize my genealogy records. When we bought our first computer, an Apple IIe, I began to use word processing software to record biographical sketches of my ancestors. At the first opportunity, I added software for constructing spreadsheets and a database. Commercial genealogical software was not yet available, but I found satisfaction in developing my own sortable lists. I filled up a lot of those big 5 1/4″ diskettes, and put away the electric typewriter I had acquired back in 1978. Then at last genealogical software became available. Over the years, I’ve experimented with a half dozen software programs, finding that each one had things I liked but lacking some of what I felt I needed. I finally settled down to the task of maximizing the features offered by a software company for whom I was a beta tester. There are many good software programs now to choose from. Often, you can get a demo version to try out; this is a good idea. Software reviews are helpful, too. About GedCom files: You will want to learn how to make and export a GedCom file, and also how to import one. In recent years, genealogists have begun to explore DNA Testing as a genealogical tool. Although the common ancestor cannot be determined specifically, by comparing your DNA test results with others, you can determine to what extent you are related. The more closely your result set matches another’s, the narrower the range of generations between the two of you and your common ancestor. Testing companies provide a kit to collect a person’s DNA sample, usually containing one or more swabs with which to scrape the inside of the cheek. When this is returned to the testing company, it is analyzed and reported back. Two types of DNA can provide information useful in conjunction with genealogy research — the Y chromosome and mtDNA (mitochondrial DNA.) Because the Y chromosome is transmitted only from father to son, testing the Y chromosome provides information about the direct male line, meaning the father to his father and so on. By comparison, mtDNA is passed from mother to child. Since only females pass on their mtDNA, testing the mtDNA tells about the mother, to her mother, and so on along the direct maternal line. Because both males and females receive mtDNA from their mothers, both men and women can test their mtDNA. Persons with a common surname (including spelling variations) have begun forming groups to share, analyze and publish the results of their collective DNA tests. By definition, utilizing Y-DNA as their primary tool. my 3-page article in PDF format, written February 2004. Once you’ve collected family data, documents, and photos, it’s time to publish. Don’t wait until you’re “finished.” Although you may eventually want to write and publish a traditional book for your family, an electronic “e-book” is an excellent way to preserve and distribute your genealogical work, even as you continue to acquire additional information. I recommend use of the PDF format. Recipients can read and print any or all PDF file pages by downloading and using the popular FREE Adobe® Reader®. However, in my subsequent CD Projects of Family History (for other surnames), I am using a different method. I have switched to producing PDF documents instead of HTML. A variety of PDF creation software is now available. The files I create in PDF are much smaller than the HTML method, and I’ve found them to be a good deal easier to create. I can still include photos, documents, charts, and text. I find it works best to create a separate file for each generation plus additional files of genealogical charts. Together, they form chapters of an “e-book.” I copy these Family History Scrapbook Pages on to Surname CDs and distribute them to relatives. I also print a couple of copies of each book and bind them or punch them and place them in binders. One of my favorite tools to gain insight into both history and genealogy is the TIMELINE. My most extensive one traces significant events in American history that happened in the month of December. I developed the first version of it as a presentation to a chapter of the Sons of the American Revolution. It is titled, “It Happened at Christmas”and is now available online as a PDF document, free as a download. This section has been expanded to include links to websites that will make it possible for you to create calendars and pages of events, calculate dates, and more. These links have been added in response to reader requests. Chronologies: Although most people think the purpose of a spreadsheet is to do mathematical calculations, I use them far more for indexing and to create my own research forms. Before spreadsheet columns made it an easier task, I created chronologies for individual ancestors and for families, tracking their locations and events. Now I use a spreadsheet. I make columns of different width to accommodate these subjects: YEAR, EVENT, LOCATION, RELATIONSHIPS OR OTHER COMMENTS. Or go online to make your own FREE timelines at OurTimeLines.com You can create a free timeline of historical events plus personal history for yourself, a family member, or any of your ancestors. The timelines you create can be placed on your web page or printed and can even be included in your family history publication if you follow the guidelines at the website’s FAQ. Find out what happened on the day of your birth and that of some of your relatives and recent ancestors. dMarie Time Capsule lets you enter the date and acquire a variety of information, including prices, wages, news headlines for the week, song and book favorites, popular toys, political names, shared birthdays, etc. The site has compiled information from 1800 to the present although not surprisingly 1800-1875 may be spotty. You can generate a calendar for any year attimeanddate.com. The site also offers a world clock, time zones, and a calculator to determine span of days between selected dates. Ancestor Search-birthday calculator enables you to calculate a birthdate from tombstone, death certificate or obituary and age at death. An associated page Ancestor Search-day of the week allows you identify the day of the week of whatever date you enter, a handy way to check your interpretation of a newspaper reference. Perpetual Calendars are useful, too. Check out this one that covers 10,000 years. Calendars That Work. Visitors may register for printable calendars for download, announced via email– without charge. Or pay a small yearly fee and download any time from more than 20 categories. These calendars are designed to work with Microsoft Word 97 and up (for Microsoft Windows). Printable Calendar. This is a real basic easy-to-use site which lets you print monthly or yearly calendars in either Microsoft Word or PDF. For links to fulfill practically all of your calendar needs or answer your calendar questions, don’t miss the Yahoo Reference Directory of Calendar sites. Surname Focus: If you’ve been doing research for awhile on a particular surname, you probably have gathered information about that surname in other places and times besides that of your own special interest. What you have learned will help others. There are an increasing number of Web Pages being designed for persons interested in one particular surname. For example, I’ve prepared one for the WHITAKER surname, and it links to others researching that name. Use the search engines on the Internet and find a surname web page that interests you. Offer your help, and in addition, you may learn new information about your own ancestor. Share your list of surnames. Add branches to your family tree. Surname Search Aids via the Internet: Several sites allow persons to place surname lists and/or GEDCOMs on their servers. Anyone using the Internet can visit these sites and search for a surname of interest. You may need to subscribe to acquire information beyond an index. These are just a few sites to check out. Family Tree Searcher Enter your ancestor data just once to search for family trees at multiple web sites. RootsWeb WorldConnect ProjectA real favorite of mine, and a very busy site; as of 2008, it has 480 million names on file. National Institute for Genealogical Studies(fee charged) — Choose one class, several classes, or take an entire series. Those interested in a certificate from the University of Toronto take a set of compulsory classes plus a number of elective classes. For several years, I was one of the authors for this program in the American Department. (Ico-authored U.S. Religious Records – Part I; authored U.S. Religious Records – Part 2; authored U.S. Migration Patterns.). The Social Security Death Index is a database of deaths reported to the Social Security Administration, mostly since1961. The Encyclopedia of Genealogy– The Encyclopedia of Genealogy is available to everyone, free of charge. Everyone can also contribute information, again free of charge. It provides reference information about everything in genealogy except people. You can search this encyclopedia of genealogical tools at any time by clicking on Search in the menus. You can also click on Index to view a list of all the entries. Genealogy Search Help for Google -- I welcome and recommend this aid for efficient genealogy searches. It will replace my "hit and miss" method of searching for an ancestor via Google™. I quote from the site: "It will create different Google searches using tips or "tricks" that will likely improve your search results. The different searches will give you many different ways of using Google to find ancestry information on the Internet. Just provide what you know about an ancestor and the site will set up the best searches for you, based on what you enter." ExpertGenealogy Metasearch -- Try this genealogy metasearch form. By entering a name once, advanced features in Google, Yahoo and MSN are automatically generated. Additionally, over 100 genealogy databases and websites can be searched. ProGenealogists, Inc. -- A super- easy-to-use set of links for records retrieval and ancestry research appears on this web site. Their selection of 50 top genealogy sites for 2010 are online at http://www.progenealogists.com/top50genealogy2010.htm Their list includes quite a few fee-based sites. Beginners Genealogy -- Links to genealogy resources to help BEGINNERS get started with genealogy research and genealogy on the internet. Cooperation and volunteerism is a wonderful shared characteristic of genealogists. A good example is the work being done in the USGENWEB project. I urge you to visit this site and investigate the states and counties of your particular interest. Sites differ from one to another, but often you can leave behind a query! You’ll want to refer often to the LDS FamilySearchpages. For years we hoped for this opportunity to use the IGI and the Ancestral File right from our own homes. Now that’s possible, and the online catalog is also a welcome addition. Their state-focused and other countries Research Guidelines are helpful, too. Two national societies hold yearly conferences and provide services to members:: National Genealogical Society and Federation of Genealogical Societies. The Ellis Island site(American Family Immigration History Center) Start out by entering the name of a passenger who came to America through Ellis Island between 1892 and 1924. Online directories such as Switchboard and WhoWhere?can help you trace e-mail addresses, phone numbers, addresses, or web pages — a good way to establish genealogy penpals. Communicating by e-mail makes it fun and easy to carry on genealogy correspondence. Keep your message threads in your “computer files” so that you can follow them from one message to another. An alternative is to print hard copies of both received and sent messages for filing in your home file cabinet. You would be wise to get “snail-mail” addresses for your correspondents since people often choose to change from one service provider to another, and you may lose track of them for awhile. A reader recommended this site which I have found useful: Online Searchable Death Indexes & Records This website gathers together links to online death indexes by state and county. Included are death indexes, obituaries, probate indexes and cemetery & burial indexes. Family Relationship Chart: People have asked me for help in determining family relationships. Often the charts I’ve seen use abbreviations and are very crowded in order to show as many as 10 generations. I’ve designed one with only 5 generations which should be easier to use because it has words instead of abbreviations. It includes directions for how to use the chart. You can print the chart or save it to a file for use later on. Look it over: Relationship Chart. Your time, your budget, your travel opportunities, and your knowledge of resources all affect how much research you can do yourself. Sometimes you find that you need professional assistance. Before you hire a professional researcher, I suggest that you read the article, “So You’re Going to Hire a Professional Genealogist,” which you can reach from the home page of the Association of Professional Genealogists at: http://www.apgen.org/ Study their list of genealogical researchers who take clients. Good luck to you as you go out to courthouses, libraries, LDS Family History Centers, the Internet, and to various archives. And remember, when you record your information (and even where you’ve looked and didn’t find what you were expecting) it’s necessary for you to document your sources.